Tamer posted pictures from the concert of himself with Montana on his official “Instagram” account. "@frenchmontana Welcome to Egypt my brother. Thanks for your invite، It’s our pleasure to have you in Egypt." He captioned. The official “Instagram” account of Egyptian actress، Yousra revealed that the actress is making a comeback to the big screen with film “Saheb El Maqam”. The film is written by journalist، TV host and writer، Ibrahim Eissa، directed by Mohamad Jamal Al Adl، and produced by Ahmed El Sobky. The film comes after seven years of absent from cinema، where her latest cinematic film is 2012 film “Game Over” co-starring Mai Ezz Eldin. Egyptian actress، Nahed El Sebai took to her official “Instagram” account to send her love to her mother، producer Nahed Farid Shawky. She posted a new photo of herself with her mother and captioned: “Traveling with my mum is sooooo much fun love my one and only #mother #daughter”. Actress، Hala Shiha shared with her fans on “Instagram” the first trailer of her new TV series “Zelzal” (Earthquake)، which will be premiered in Ramadan 2019. Moreover، Egyptian actor، Mohamed Ramadan posted a new poster from the TV series on his official “Instagram” account، announcing that it will be premiered on MBC 1 and on DMC TV channels. Zelzal co-starring Mohamed Ramadan، Hala Shiha، Maged El Masry، Ahmed Siam، Nesreen Amin، and others. Egyptian actress، Rania Youssef posted a new video on her official “Instagram” account of herself while she was feeding ducks in London. "Some birds are not meant to be caged, that's all" she captioned. Some birds are not meant to be caged, that's all . Hend Sabry promotes for her new film "Al Mamar"
Tunisian actress, Hend Sabry released on her official “Instagram” account the trailer for her new film “Al Mamar”. “#film Al Mamar trailer … June 2019” she captioned. Al Mamar co-starring Ahmed Ezz، Hend Sabry، Mohamed El Sharnouby، Mohamed Farag، Asma Abulyazeid، Ahmed Salah Hosny، Amir Salah Al-Din، Mahmoud Hafez، Eyad Nassar، Ahmed Falawkas، Mohamed Gomaa، Alhan Elmahdy، Mahmoud Hegazy، and others. The film is written by Amir Teima، and directed by Sherif Arafa. Al Mamar film revolves around the Egyptian Thunderbolt Forces during the war of attrition، headed by the leader of the 39th group، martyr Ibrahim Rifai. Late Egyptian singer، Abdel Halim Hafez and Lebanese superstar، Carole Samaha will perform Egypt’s first hologram concert ever to be held in Egypt at Al Manara International Conferences Center ، in El Tagamo El-Khami (Fifth Settlement) on Friday, April 19. She took to her Instagram account to post the concert’s poster and captioned: "Live in #concert next Friday April 19th #egypt at #ManaraTheater Featuring the Legend Abdel Halim Hafez In HOLOGRAM Technology for the 1st time in Egypt @almanaraintconferencescenter" she captioned. Egyptian actress, Hala Shiha partook in ‘The Color Run’ event with her sister, Maya Shiha, Tunisian actress, Dorra Zarrouk, and others. The parties shared on their “Instagram” account pictures from the event. The Color Run is a five-kilometer, untimed event, also known as "the happiest 5,000 meters on the planet", is an event, series, and five-kilometer paint race. Demi Lovato is sporting a new look! 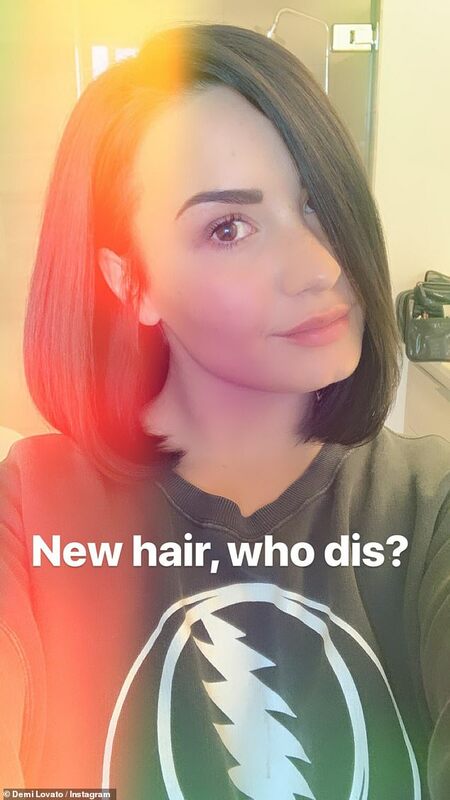 The 26-year-old singer debuted her new haircut via "Instagram Story", which featured her brand-new cut and notably darker hairstyle. “Hilarious and terrifying،” Grande wrote. Grande has been open about how she has struggled with PTSD symptoms since a 2017 attack at her concert in Manchester, England. Chrissy Teigen and John Legend had a day at Disneyland with the kids! The couple were joined by their two-year-old daughter Luna and 10-month-old son Miles as they visited the theme park on Friday morning in Anaheim, Calif. The family stopped by the Grand Californian Hotel where they kicked off their day with a magical moment with Princess Tiana during their Disney Princess Breakfast Adventures. “Luna had a Disneyland birthday today! (As far as she knows, her birthday is today. Don’t tell her it’s sunday please. Daddy has to work on Sunday. Thank you. ),” John wrote on his Instagram.